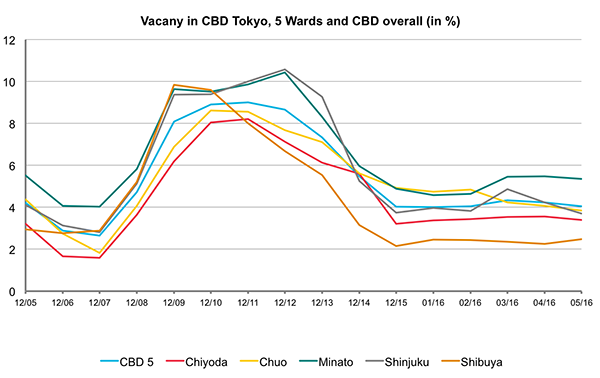 The vacancy rate of Tokyo CBD 5 Wards reduced steadily since 2012 and reached to 4.0% at the end of 2015 despite of a large supply of new class A buildings in 2015. The decrease paused in Q1 of 2016 while the rent continued to increase, mainly because of the relocation of some huge occupiers to better and larger spaces. The vacancy rate started decreasing again in Q2 of 2016. New supply of Class A buildings in 2016 is expected to be almost the same level as in 2015 and many occupiers, such as trading companies and financial firms, are now planning to move to higher quality and larger spaces. We believe, that the continuing solid demands of occupiers will keep the vacancy rate at low levels and rents will continue to grow. 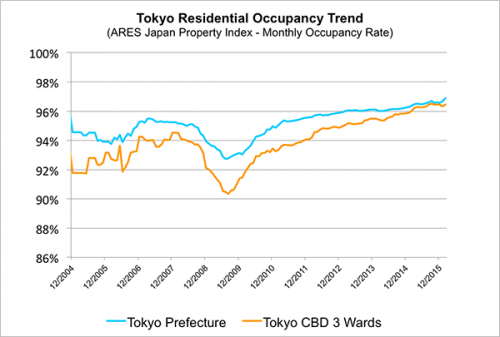 Residential occupancy maintained at healthy levels above 95% and rent of each area in Greater Tokyo kept stable with some rent growth seen in some areas. 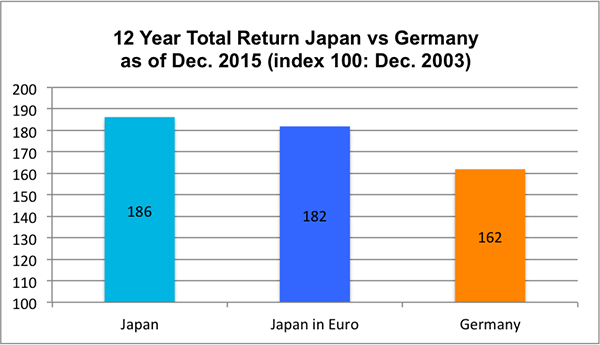 Asset under Management (AuM) of J-REITs and Private Funds continued to grow, reaching to JPY 28.8 trillion in December 2015 and increased by JPY 1.1 trillion (4%) for the year. J-REITs dominated the market in Q1 of 2016, closing 23 deals priced at more than JPY 10 billion. 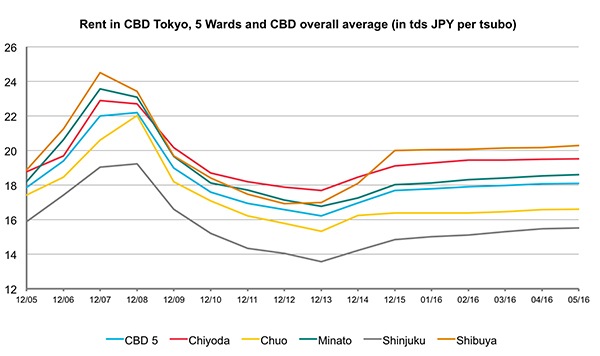 In 2015 J-REITs closed 11 transactions priced over JPY 10 billion in the first Q, and 17 deals from Q2 to Q4. The largest J-REIT Transaction in Q1 2016 was a logistics facility in Greater Tokyo executed by LaSalle Logiport REIT at JPY 26.6 billion. All top ten transactions in Q1 2016 were either logistic and hotel properties. The largest office transaction in Q1 2016 was made by Hulic REIT. Hulic REIT, sponsored by a Mizuho Group, acquired a additional 30 % share of Hulic Kamiyacho Building in Minato Ward at JPY 16.7 billion. J-REITs acquired 12 apartment buildings all together amounting to JPY 42.3 billion in Q1 of 2016. Private finds and companies were less active, with only 4 deals priced at more than JPY 10 billion in Q1 of 2016 reported by Japanese media. They closed 13 deals priced over JPY 10 billion in the same quarter 2015, and 31 large transactions during Q2 to Q4 last year. US firm, Lone Star, acquired a residential portfolio from Saizen Real Estate Investment Trust at JPY 44.7 billion in Q1 of 2016. With this transaction, Saizen, a Singapore stock exchange listed REIT, soled its total portfolio consisting of 136 apartment buildings all over Japan. This deal followed soon after US Blackstone’s similar deal in Q4 last year. Blackstone acquired Japan Residential Investment Company, listed on the AIM section of the London Stock Exchange, who invested in 57 properties worth JPY 47 billion in Japan.